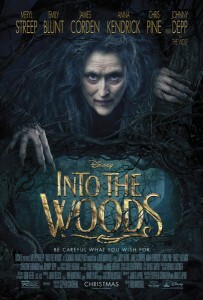 Into The Woods celebrity interviews | DaDa Rocks! Recently I was invited to the Disney’s Into the Woods movie junket. 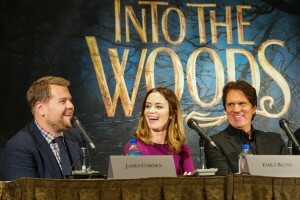 The Junket was host to two panels – the first had James Corden (“The Baker”), Emily Blunt (“The Baker’s Wife”), Anna Kendrick (“Cinderella”), Chris Pine (“Cinderella’s Prince”), Director Rob Marshall, and Screenwriter James Lapine. The second panel featured Meryl Streep (“The Witch”), Christine Baranski (“Cinderella’s Stepmother”), Tracey Ullman (“Jack’s Mother”), Producer Marc Platt, and Producer John Deluca. Cinderella’s Prince played the Chris Pine (star of Star Trek), the Prince says during a key scene “I was raised to be charming, not sincere” of which Pine spoke about that one line informed his character. The Prince is given the opportunity to reflect on his effect on Cinderella but only for a moment and then chooses to get back on his horse and ride off. Meryl Streep probably is the actress every actor and actress wants to be and when she decides she is going to sing well imagine the pressure. She was the first to come on board after years of turning down similar roles to take on the role of “The Witch” who longs for beauty and companionship. The one thing I was surprised by this New Jersey native at the press conference was her self-deprecating humor. I loved that she joked about rapping in the movie, “I haven’t really done my real rap scene yet”, wondering if Stephen Sondheim was aware it was even rap when he wrote that scene. Christine Baranski spoke about how she had tried to convey a contemporary attitude, which would resonate with today’s viewers. She, Lucy Punch and Tammy Blanchard presented Cinderella’s stepfamily as social-climbing narcissists, obsessed with fashion and fame (personal fame, not necessarily the fame of others). Baranski not naming any names but pointed to reality shows that came to mind. Tracey Ullman was asked about her pop singer status and responded graciously, calling herself a one-hit wonder, then singing a bit of “They Don’t Know About Us.” Streep and Baranski were quick to mention other Broadway musicals she’s appeared in, clarifying for those who didn’t know, that Ullman is a talented singer and actor with a long history in music and theater. 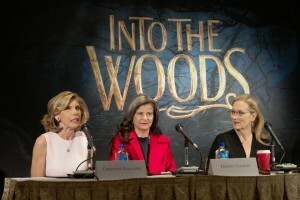 Christine Baranski, Meryl Streep and Tracey Ullman are long-time friends and have a sisterly affection for each other. The easiness and banter amongst them during the interview was what made it amazing and I’m happy to share two clips with you below. They were obviously having a good time joking with each other. 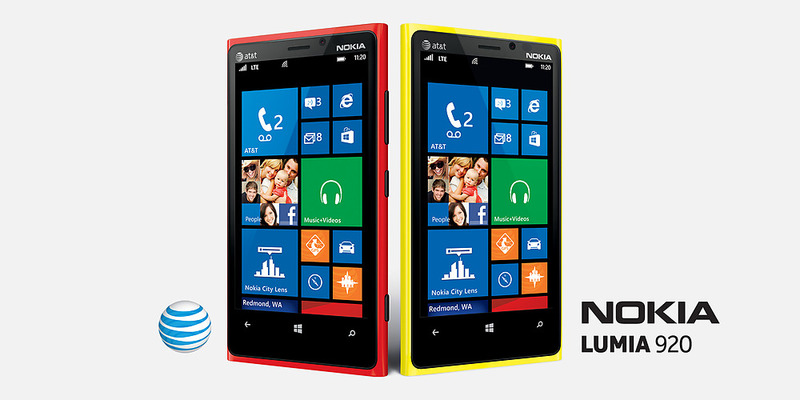 NextAnnie: The Classic Comes to Life in A Whole New Way!